Chest Press – Seated chest press station. 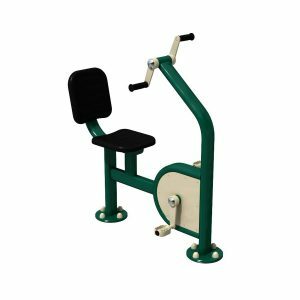 Sit-Up Bench – Single seat and foot holds. Step-Up – Multi-height step platforms for different leg/abdominal workouts. Leg Lift – Handles, a back rest and soft touch elbow rests. 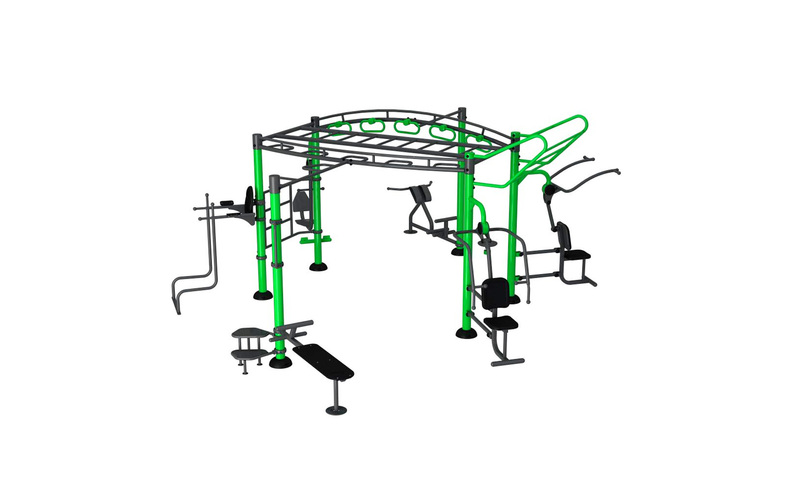 Multi-Use Frame – Ergonomic low level frame for triceps dips / press-ups. Leg Press – Seat and foot plates. Users body provides the resistance. Pull-Up Bar – 1.3m wide bar. 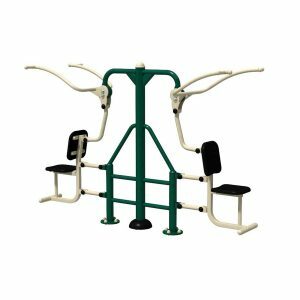 Pull-Down Challenger – Seat with twin pull down handles for various types of pull-downs. Hip Twister – Rotating standing plate and supporting handles. Ninja Rings – Arc design & moving bars give an even greater challenge. 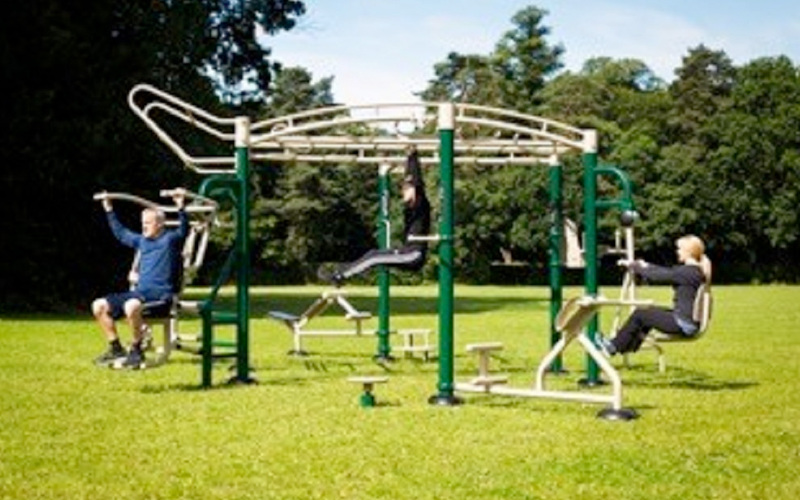 Static Monkey Bars – Wide bars for static pull up or traversing. Horizontal Ladder – an 11-bar ladder for pull-ups, hanging leg raises, etc. Flying Pull-Up Bar – 45° triple bar ladder to jump between each bar – for explosive pull-ups. Pull-Up Station – Static handles for various types of pull-ups. Vertical Ladder – Multi-level bars for stretching & Strength building. Dorsal Raise Station – back extensions, wide grip dips, side crunches, etc. Introducing the latest addition to our Outdoor Gym Equipment range – The Big Rig combines 7 fixed workout stations with multiple pull-up bars. This makes The Big Rig ideal for Secondary Schools, Open Parks, Parish Councils, etc – as The Big Rig provides unlimited opportunities to challenge everyone looking for that creative bodyweight workout. The Big Rig combines a versatile full body training station, with multiple workouts to keep you training fresh and insteresting. The equipment is designed to help build and tone muscle, increase cardiovascular strength and assist in balance and co-ordination workouts too. Suitable for users over the age of 15 – there is potential to add additional training items – such as straps, punch bags, battle ropes, etc. 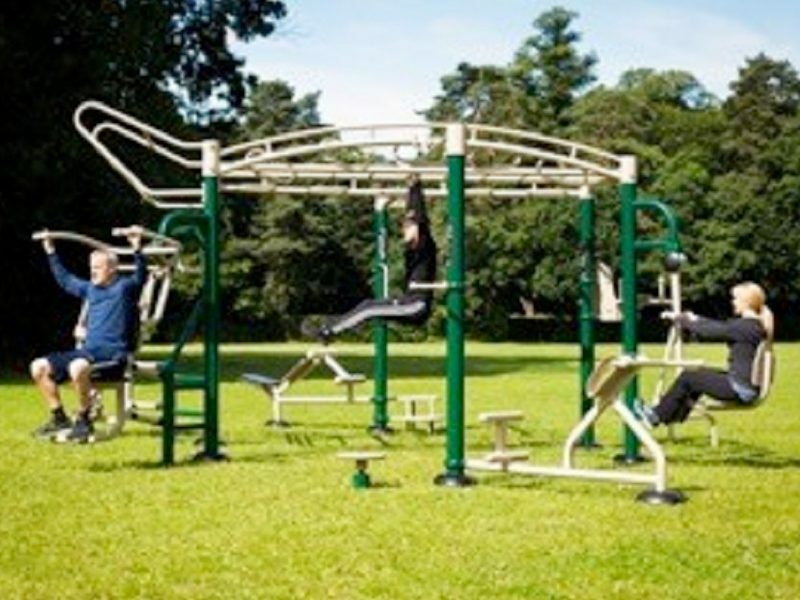 The Big Rig can also be extended to a full outdoor gym with products from our large range of Outdoor gym equipment. The Big Rig can be installed into grass, concrete or tarmac with protective Grass Mats, Wetpour or PlayBond safer surfacing. EN16630 Compliant – No crush points, entrapments or sharp edges.